Beach School is a unique educational intervention program that helps pupils get more inspired, motivated and re-engaged with school life and their learning. Our six week Beach School programme is aimed at Year 5 to Year 9 pupils and groups who find engaging with school challenging, may have become dis-engaged with their learning and are at risk of failing to reach their potential through a lack of confidence, motivation or low self-esteem. 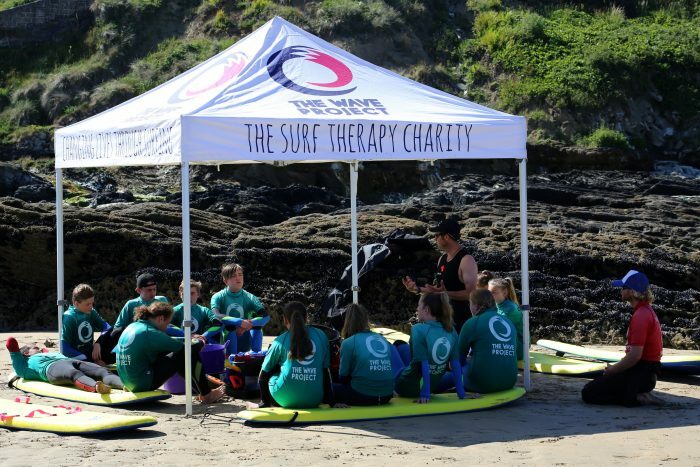 Learning takes place at the beach and in the surf across various Cornish coastal locations with surfing and other water based activities incorporated into each session. Wave Project teachers and instructors deliver a range of creative and engaging learning activities, with a strong emphasis on utilising the coast and surf environment, that are linked to a range of national curriculum subject areas. By holding the lessons outdoors, on the beach and in the sea, pupils will be encouraged to think differently about each subject, re-boot their interest and engagement, remove barriers to learning and think more creatively. A key principle of our Beach School programme lies in its flexibility and adaptability to meet the needs of pupils and school leaders. Our evidence based approach means that we work in partnership with teachers and school leadership to identify and target those young people who would most benefit from attending, and help schools evidence the effectiveness and impact of the programme on pupil outcomes. Improvements in confidence and self-esteem. Improvements in emotional well-being, reduced anxiety and feeling calmer. Developing positive relationships, reducing isolation, making friends and developing support networks. Increased understanding of and attitude towards curriculum subjects. Improved confidence in their school and their individual learning ability.